Welcome to our Wedding page! We have information about our wedding and pictures. We want to thank the many friends that have made our special day possible. 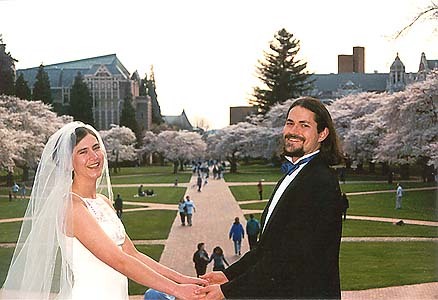 Our wedding was August 12th, 2000 at 6pm in the Green Lake Church of Seventh-day Adventists in Seattle. A reception followed at the Kwiram residence. You can download our wedding program in PDF format (viewable with free Adobe Acrobat). Our mom, Marit Aldrich, read "Ten Commandments for a Mother-In-Law" by Iola M. Irwin from a Dear Abby column. We have several albums of pictures from our wedding. All but our dating pictures are available at www.ofoto.com, where you can view them and even order some for yourself. Thank you to the many friends and family who are helping us with the wedding, reception, invitations, and much more!